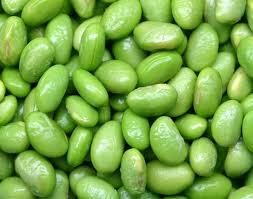 Edamame is something I discovered far too late in life. I first met this magical snack years ago covered in salt as a pre-meal treat at a japanese steak house. Deee-lish! I’m now stunned and pumped to learn that it is packed with Fiber, Protein, Thiamin, Iron, Magnesium, Phosphorus and Copper, and a very good source of Vitamin K, Folate and Manganese. 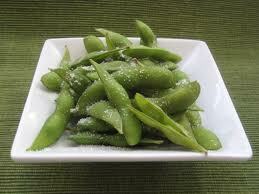 1 cup of edamame has about 180 calories, 17 grams of protein (hell-o! ), no saturated fat and 8 net carbs, if you’e counting. So, buy ’em frozen, shelled or in the shell. I keep heaps of bags in the freezer! If you so desire, lightly sea salt them, and enjoy! 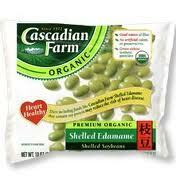 Put these magical green gems into salads, pasta sauces, soups or grind ’em up to make dips or humus! Previous Previous post: RANT: Darwinism or Gluttonism?